Every Instagram-worthy dinner starts with a well-stocked supply of kitchen tools. 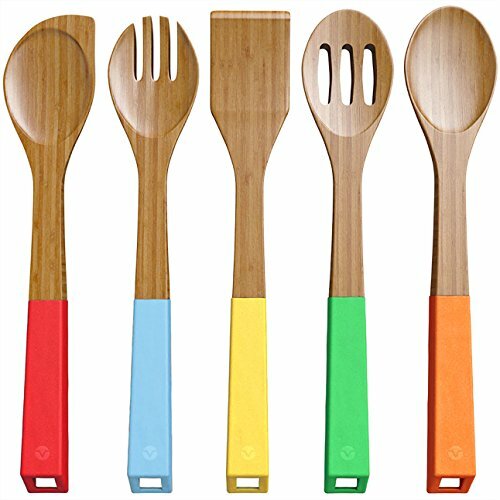 Vremi’s Stir Crazy Bamboo Spoons Set has you covered, with 5 standard cooking utensils in natural bamboo wood. This set includes a spatula, turner spoon, mixing spoon, forked spoon and slotted spoon. The healthy choice for frying, stirring soup or turning pancakes for your kids. Also great for serving food at the dining table like pasta or vegetable salad, and perfect for nonstick cookware. Made of high quality natural bamboo with nonstick finish. Features built-in holes for space saving hanging storage. Accented with bright red, blue, yellow, green and orange colors and ergonomic silicone handles to add a decorative splash to your kitchen. Hand wash with warm soapy water and dry thoroughly to clean and preserve quality.